I am a kid again when asking for an autograph from anyone wearing a Major League uniform – from the stars to the youngster just brought up from the Minors for a “cup of coffee.” For a half century I’ve been a collector. I’ve watched promising rookies develop into stars, and I’ve watched them retire – some gracefully, some not. But I have their autographs as a part of their history and mine. 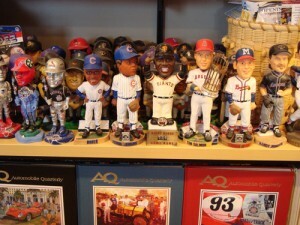 The collection officially started in 1962 when I met the “Yankee Clipper,” Joe DiMaggio, at a Housewares Show in Chicago. “The Great DiMaggio,” as Hemingway called him in his classic book “The Old Man and the Sea,” was signing autographs in the Mr. Coffee® Booth. I became star-struck upon meeting my boyhood hero and couldn’t speak. My collection of autographs now totals nearly 2,000, covering a span of years from 1938 to today, and includes pitcher Johnny Vander Meer who pitched consecutive no-hitters on June 11 and June 15, 1938 (pitchers worked every four days in that era) – a record that probably will never be broken. It also includes Don Larsen, who pitched the only perfect game in World Series history in the 1956 World Series; Al Downing, who served up the home run pitch to Hank Aaron that broke Babe Ruth‘s record of 714, in 1974; and “Mickey, Willie and the Duke,” arguably three of the greatest center fielders to ever play the game, playing in New York (at the same time) with the Yankees, Dodgers and the Giants in the 50s. These all grace my shelves. 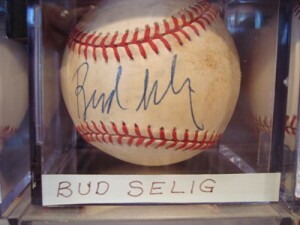 The “Shot Heard Round The World” – the home run hit by NY Giants third baseman Bobby Thomson off a pitch by Brooklyn Dodger Pitcher Ralph Branca to win the 1951 3-game National League Playoffs for the Giants is one of my most treasured balls, featuring both players’ signatures on the center channel of the ball – called the “sweet spot” or the “Manager’s Spot” by autograph seekers. The collection includes 48 current members of the Baseball Hall of Fame in Cooperstown, and another couple dozen who I am certain will be elected in years to come. I’ve autographs of great coaches, managers, owners, announcers and umpires: Tommy Lasorda, Buck O’Neil, Earl Weaver, Joe Torre, Tony La Russa, Ozzie Guillen, Dusty Baker, Art Howe, Peter Gammons, Ron Santo, Harry Caray, Joe Garagiola, Bob Uecker Steve Stone, Hawk Harrelson, Arte Moreno, Bud Black, Ed Runge, Durwood Merrill and Don Denkinger – and the Commissioner of Baseball: Bud Selig. 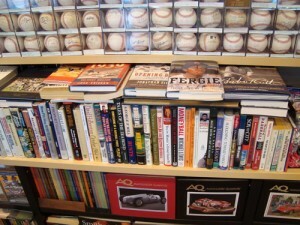 My collection of memorabilia is supported by an extensive library of books on almost every aspect of the game – totaling nearly 300 books and growing – I am a student of the game. Toss into the collection a shelf full of Bobble Heads, notebooks of Baseball Uniform Patches, myriad autographed photos, stacks of bats, and some of the most beautiful original paintings of past stars you could ever ask for. 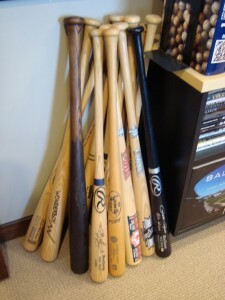 These make up my (ever-expanding) collection, which chronicles my youth and keeps my passion for the game alive.